It's Sept. 1, and the demolition has begun. 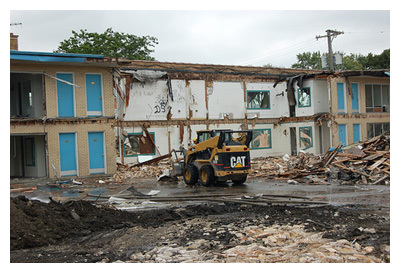 Bulldozers are charging in, pulverizing the seedy rooms of the Stars Motel, which has stood at 6100 N. Lincoln Ave. for more than four decades. Of the original 14 hotels and motels that once occupied Lincoln Bend, the strip of Lincoln Ave. between Foster and Devon, the Stars Motel is the fourth to come down. Two others have been condemned and the city of Chicago has its eyes on the remaining nine. Unlike the three motels that were condemned by the city, demolished and turned into a public development projects, the Stars was sold to a private developer, S&S Home Builders LLC. A five-story condo development, Village Center, will soon occupy the former site of the Stars. According to Scott Schiller, who owns S&S Homes together with Michael Schwartz, the two bedrooms, two bath units in the new condo will start at a little under $300,000 and go up. "It's a highly desirable area," notes Schiller, who also says that the prices of his condo are "the cheapest thing around." Central to the story of Chicago's motel row, in which the motels have for over a decade been targeted by the city as condemned property — for supposedly encouraging drug sales, prostitution and crime — is a battle between the hotel owners and the city, over the owners' inherent property rights and the city's case for gentrification. 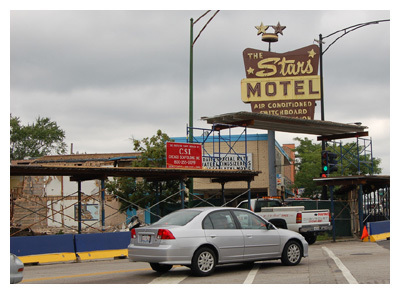 Shirad Dani, former owner of the Stars, is resentful of the city's war on the Lincoln Avenue motels, which he says started about 10 years ago. "The city, the government and the police brought unnecessary crackdown on the hotels," he says. In 19 years of business, Dani says not one arrest took place at the Stars. In 1996 Mayor Richard M. Daley started cracking his whip, forcing Chicago police to provide the names and addresses of those arrested for soliciting prostitutes to the local and out of state newspapers. In 1998, the Lincoln Avenue motels came under further fire from Daley, who claimed that they were houses of prostitution and drug deals. Through Daley's initiative, three motels — the Riverside, the Spa and the Acres — were slated to be condemned through the city's power of eminent domain and turned into a park, a 20th district police station and a Chicago library branch, respectively. Daley's plan was to redevelop the area and attract developers through the public projects and subsequent improvement of the area. "Politically, the city wanted to get their hands on the motels for real estate — they were an easy target," says Dani. Originally built in the '40s and '50s to accommodate travelers from Illinois Highway 41, formerly Lincoln Avenue, which served as the main thoroughfare between Milwaukee and Chicago, the hotels saw a decline in business after the Edens was built in 1951. In 2003, the Department of Public Planning went after two more hotels, the Lincoln Hotel and the Patio, with plans to develop condos on the properties. Both of these hotels were condemned by the city. By this time, Daley's plans had gone through — the park entrance, police station and library were all in place on the sites of the seized motels. In the case of the Lincoln and Patio, however, the city's intention was to use the power of eminent domain to obtain the hotels, demolish them and hand the land over to private developers. No plans were in place for public projects, which in the language of eminent domain is something designed for public good — a road, school, library, police station, park, etc. The city wanted to take private property and hand it over to private developers for the sake of "economic development." As with the controversial U.S. Supreme Court decision (Kelo vs. New London) last summer that allowed a Connecticut town to condemn a "blighted" property and hand it over to a private developer, the issue of what is an appropriate use of eminent domain comes into debate. The Fifth Amendment to the Constitution states that private property shall not be taken for "public use," without just compensation. While "economic development" may have won in the case of Kelo vs. New London, it is not convincing the hotel owners on Lincoln Avenue. In 2003, the Chicago department of Planning and Development approved two condominium developers to build on the sites of the Lincoln and the Patio — Glenview-based Lettvin Development Company and Skokie-based American Landmark Properties. 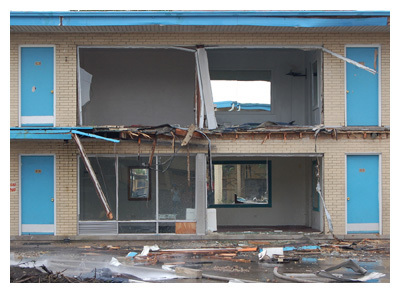 Each hotel owner would receive up to $500,000 from the city to cover the cost of demolition. Despite efforts by the city, officials have been unable to claim the Lincoln Hotel or the Patio through power of eminent domain. The hotel owners are fighting it. According to Schiller, the owners don't feel it's appropriate use of eminent domain for the government to take their property away and hand it over to a private developer instead of using the land for a public project. "The owners want to sell when they're ready, and they feel that the government can't just come and take their businesses away," says Schiller. Perhaps the price, $500,000, is also an issue. Dani, who sold the Stars Motel to Schiller and Schwartz for over $2 million, may just be one of the lucky ones. "Everybody wants to sell, if the price is right," he says. The difference between half a million dollars and almost $3 million is a case in point. "I feel sorry for the hotel owners," says Dani. "The city's not buying them out, no one's coming forward to buy them out, thanks to the city's supposed 'crackdown.'" According to Dani, for 10 years the city's been systematically putting pressure on the hotel owners, which has contributed to a decline in business. Pressure in the form of routine police searches of customers and their cars drives customers away, Dani says. Dani argues that the Stars Motel, as with the other hotels, is not as sinister as people think. "It was wrong on the part of the government to say the hotels were only charging hourly," he states. According to Dani, the Stars Motel was often a place where singles met, where couples celebrated their anniversary. At $65.00 per night, the Stars offered middle class and lower income people a hotel rate they could afford. "Not everybody has to spend $150 a night," Dani notes. Manu Patel, who has fought to hold onto his hotel, the Apache, counts a priest and a monk in among those who have stayed in his hotel on a per-week basis. An icon for travelers, a place of happy memories for some, a vision of disgust for many, the Stars Motel has seen its share of good and hard times within its lifetime in Chicago. S&S Home Builders respected that, and rather than destroy its fantastic sign, they put it up for auction on Ebay in hopes for finding a it a home. For now, the owners of the motels and hotels still left standing on Lincoln Avenue are fiercely holding onto their property as they fight the issue of eminent domain in regards to economic development — they maintain their inherent right not to allow the city to take away their property away and give it to someone else. A new law on eminent domain in Illinois, which comes into effect Jan. 1, should affect the Lincoln Avenue establishments. This law designates those seeking to obtain a property to first prove the land is blighted and necessary for a public purpose. This means that city officials will think twice before going after the relic hotels on Lincoln Avenue for purposes of "economic development." As shown in the case of the Stars Motel, one man's blight is another man's treasure. 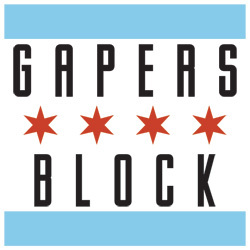 Gapers Block: Ask the Librarian: What's the Deal with All Those Motels on North Lincoln Avenue? Marla Seidell is a freelance writer and copyeditor with a passion for belly dance and curries of any kind. 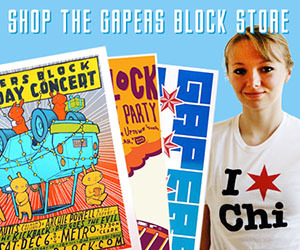 She moved from Amsterdam to Chicago in 2004, following a six-year stint as an expat in the Netherlands.